Coverfox is an online insurance broker founded in 2013, that grew from a 2 person startup to a 400+ strong company within a few years. The company raised a Series A round of €1.70 million, and followed it with a €10.19 million Series B round in April 2015, from Accel Partners and SAIF Partners. 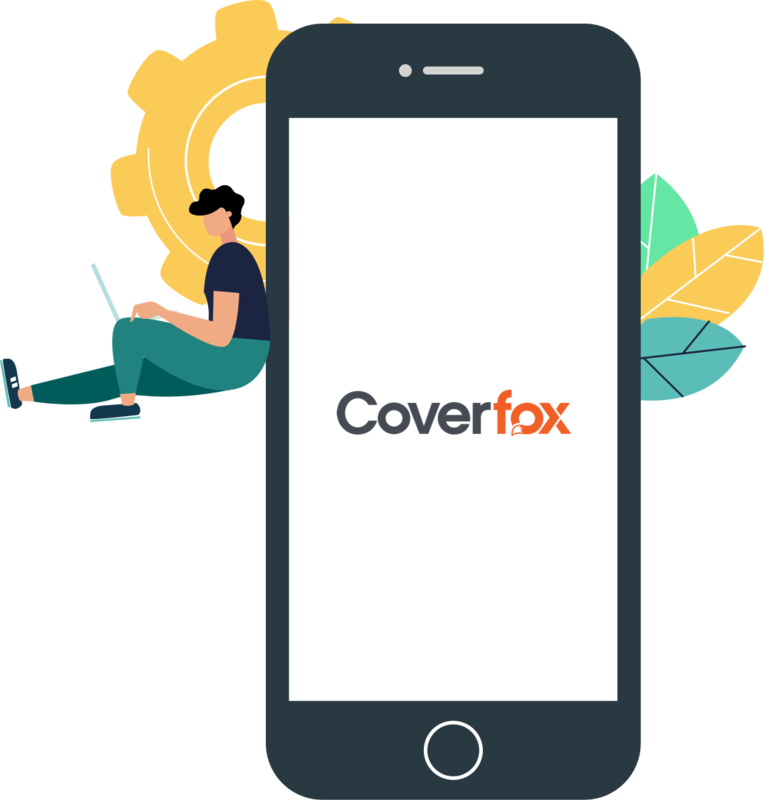 Coverfox provides quick and easy solutions for everything ranging from life insurance, to term insurance, to vehicle insurance, for the modern customer on the go. Traditional marketing methods offer very few options apart from static broadcast ads to market products like insurance to a targeted audience. And cold calling is one of the most ineffective ways to get clients onboard, with less than 1% of cold calls converting into appointments. Coverfox as a brand is built to cater to a millennial audience with their fast, easyto-implement cover plans and approachable process. They wanted a marketing campaign that could reach a targeted millennial audience, create a conversation, and generate interest in the product, all at once. 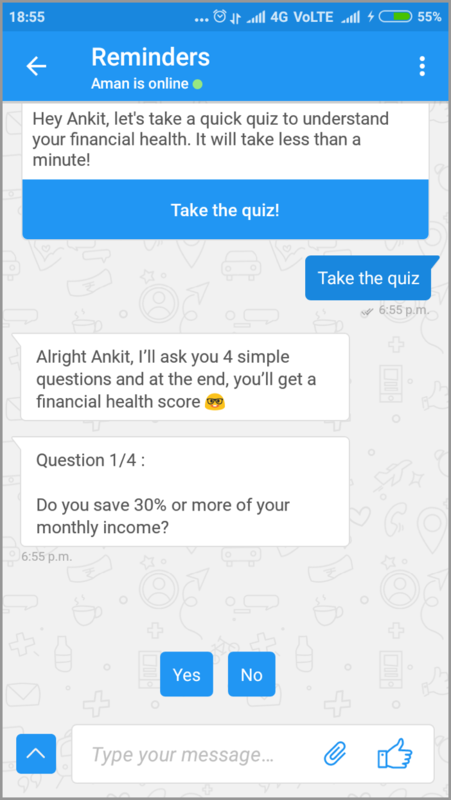 We began by creating a Financial Health Quiz chatbot for Coverfox as a hook for the campaign on Haptik's Personal Assistant app. 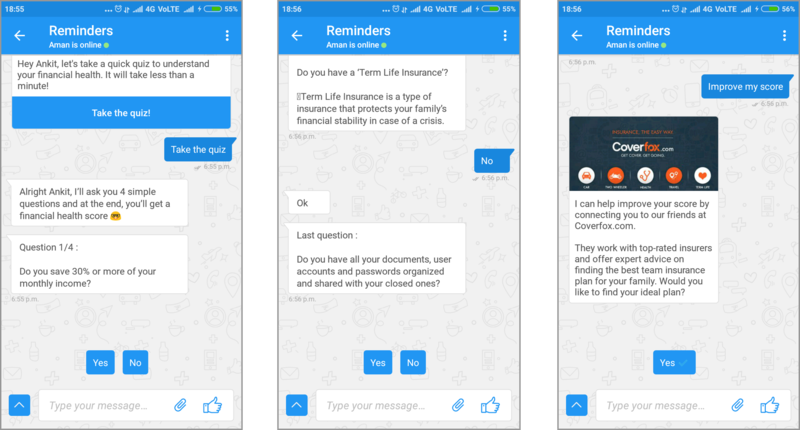 The quiz was divided into 4 questions, based on saving habits and insurance, which helped to build a profile of the user. Once the bot gave the user a score out of 5, they were given the choice of improving their score with the help of Coverfox. Once a user expressed their interest and consented to it, they were directed to the Coverfox team, which then took the conversation further. This intent-driven marketing method not only gave Coverfox a better way to reach potential customers but also created a conversation about the brand while advertising it. The campaign, which started in August 2017, saw over 7 lakh Impressions and had an impressive 16.79% conversion rate - with over 46% of quiz takers falling in the 26 to 35 age group of millennials. Re-engage your audiences with chat-based ads on India’s largest publishers.